TransAsia Airways flight GE235 made a mayday call shortly after it took off from Taipei Songshan airport on Wednesday morning, reporting an engine flame out, reveal air traffic control recordings (23:25 – in Mandarin). At a press conference, it was revealed that the left engine was recently replaced in Macau due to problems, reported Flight Global, a trade publication of the aerospace and aviation industry. The ATR 72-600 turboprop plane is powered by a Pratt & Whitney PW100-127M engine. The small craft with 58 people on board clipped an urban highway bridge before it careened into the Keelung river. So far 15 people have been reported dead but it’s feared many of the 24 still missing may add to the death toll. It was en route from Taipei Sung Shan to Kinmen Shang-Yi Airport, in Fujian Province, China. At a press conference in Taipei, Taiwan chief executive Chen Xinde urged people not to speculate on what caused ATR 72-600 to crash, and to wait for the flight recorders to provide more information. Taiwan’s Civil Aeronautics Administration director general Lim Tyh-Ming said the 42-year-old pilot had nearly 5,000 flight hours, the majority of which was flying the ATR aircraft. Likewise, the co-pilot has almost 7,000 hours under his belt, 6,500 of which were also with the ATRs. 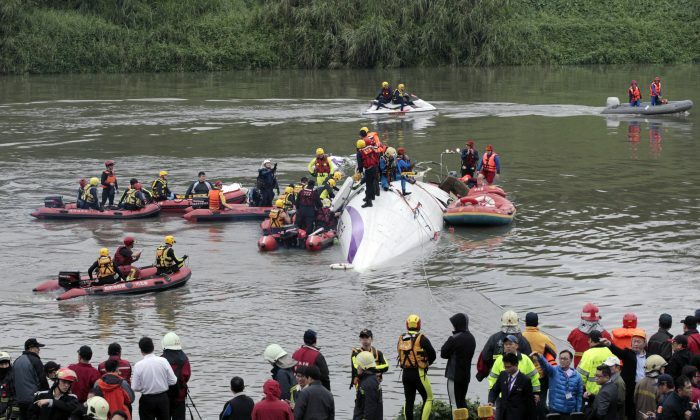 The ATR 72 had been in the air for TransAsia for 10 months. The last time an TransAsia Airways had a fatal accident was last July when another TransAsia ATR-72 crashed killing 48 of the 58 people on board. In 2002, an ATR 72-200 cargo plane from Taipei to Macau crashed because of ice conditions. Both pilots were killed. A car dashboard camera caught footage of the crash.